Finally, there’s a website version of Android Market where you can browse through all of the apps for your Android phone or tablet. It’s not that it is hard to find apps on the phone or tablet versions of the Android Market, but it doesn't lend itself to browsing the way it does on the computer. And on the surface, Android Market appears to be a step forward. When you go to market.android.com, you’ll see a list of the categories of apps, the featured apps, top paid apps, top free apps and best-selling games. Click on any title and you’ll get detailed information on the app, ratings and reviews. There are also related apps, which help in the discovery process, as you make your way through the app catalog. Once you’ve found an app, you can send it to any device associated with your Google account. For free apps, you pick your device and then it’s one click to install. For paid apps, you’ll go through the usual checkout process. But below the surface, Android Market still has the same issues as the phone-based version, and adds some new ones as well. One big drawback of Android versus the iTunes experience is purchasing apps from foreign developers. In iTunes, you make a purchase, your credit card is charged and you're done. With Android, both on the phone and the webstore, you actually purchase the app through a Google affiliate overseas, in the local currency. This creates two huge issues. First, only certain credit cards allow foreign purchase transactions through the Android Market—if you want to use American Express, you're out of luck. Second, your credit card company may charge you a fee for the foreign currency transaction, which you won’t see until you get your next credit card bill. Generally, 3% for U.S. customers, though fees for customers outside the U.S. may be much higher. Overseas sellers are easy to spot because they have a tilde before the price (for example ~$1.00). We also found in our testing that the online Android Market is very buggy when it comes to associating user accounts with devices. Some accounts worked fine. Others, showed no devices associated with the account or only old phones that were no longer being used, making it impossible to use the Android Market to push apps to our phone. Based on comments in the Google shop forums, this is a common problem. 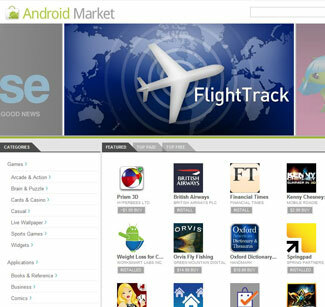 With more than 200,000 Android apps available, the Android Market Web Store was long overdue. I, for one, will enjoy digging in, as Google gets these issues worked out.